While visiting London earlier this summer, I ventured out to the Kew Gardens with a journalist friend from the International New York Times to partake in an impossible-to-resist combination: fancy cocktails, fresh air, and a fantastic setting. As we sipped on Kew-cumbers, Rose Gardens, Gooseberry & Fennels, and Strawberry Cups -- all gin-based drinks concocted from fresh botanicals and seasonal fruits that grow in Kew Gardens -- we chatted with Gin Garden founder Jo Farish about her enviable job creating plant-based pop-up bars at all kinds of interesting places in and around London. Read my article for Zester Daily, "Cocktails Get Royal Treatment In Gin Garden Pop-Up Bar," as a pdf, or click "Read more" below for the full text. With the world’s largest collection of living plants, and its scientists working around the globe to preserve biodiversity, the Kew Royal Botanic Gardens in London is internationally renowned for its conservation work. Less well known, perhaps, is the fact that its 300-acre grounds harbor the ingredients for some darn good cocktails. “Sweet cicely, or garden myrrh, is very fragrant, but it also has a natural sweetness so it’s good to pair with rhubarb,” says Jo Farish, founder of the Gin Garden, as she hands over a Strawberry Cup. The beguiling early summer concoction of strawberry-infused gin, homemade rhubarb-and-sweet-cicely cordial, and lemon juice is garnished with fresh strawberries, cucumber and edible flowers. The Gin Garden’s summer residence at Kew Gardens, where Farish and her team have turned a small greenhouse into a jungle-like bar serving up gin cocktails and tonics on weekends (Friday through Sunday) and British bank holidays, offers plenty of inspiration for mixologists. “We’re taste-testing new ingredients as they come into season – we’ve been infusing cherry gin, with more fruits and berries coming up, and the lavender and Roman chamomile growing over there will be used in drinks when they’re ready,” Farish says. Serving drinks based on what’s growing nearby is the focus of the Gin Garden, which Farish started up in fall 2012 after a successful trial run making apple martinis for an event at a historic house and garden run by the U.K.’s National Trust from the apples, lavender and honey from the property’s grounds. Her company, which has taken its traveling botanical bar to museums, flower shows, design fairs and other locations in and around London, melds Farish’s background in event planning and garden design – and, she says, some very British sensibilities. “British people are real gardeners and lots of people make their own gin. The two go hand in hand,” Farish says. “People are used to preserving [food] and having something to get through the winter.” She assures urban dwellers with more limited space that plenty of cocktail ingredients are easy to cultivate in a window box. In addition to its pop-up bars, the Gin Garden also offers workshops on growing botanical ingredients at home and making infusions and syrups. To make the infused gin that forms the base of their refreshing Kew-cumber cocktail, for example, Farish recommends slicing up cucumbers like you would for a sandwich, filling up a Mason jar halfway with the vegetables, and topping it off with gin. A Gooseberry & Fennel cocktail is made from gin infused with the fennel that grows wild along the coast of Norfolk, in the east of England. The drink has a subtly acidic bite – and plenty of health benefits. “Gooseberries have vitamins A, B, C and antioxidants; they were actually used to ward off scurvy before citrus fruit was available in the U.K.,” Farish says. The passiflora tincture in the Rose Garden cocktail, for example, is said to be good for anxiety, while the namesake ingredient in the Elderflower Fizz is believed to improve resistance to allergens. Angelica root, one of the six botanicals in the No. 3 London Dry Gin used to make the Kew cocktails, has long been employed in traditional medicine as a treatment for digestive issues. “Nearly all plants have some kind of health benefit,” says Farish, who prefers to use a masticating, or cold-press, juicer for serious cocktail-making because it preserves more of the nutrients in fruits, vegetables and herbs. 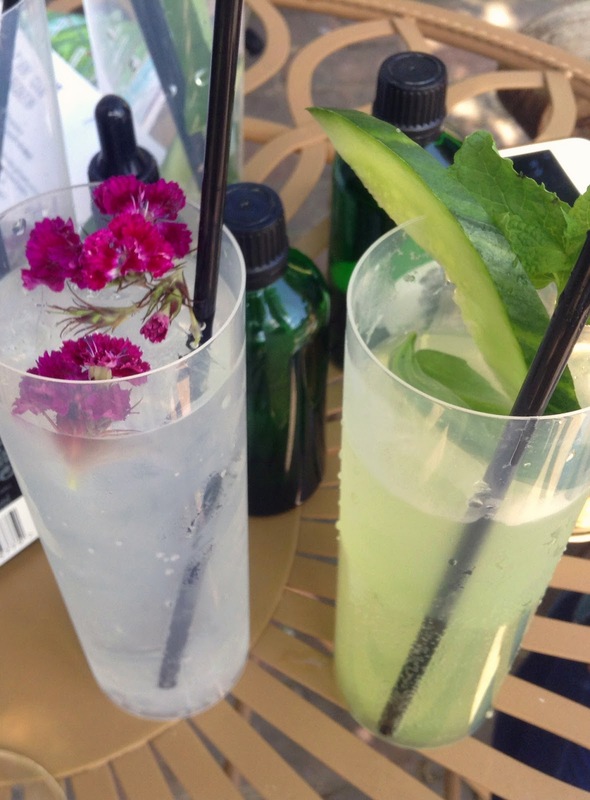 Some of the Gin Garden’s drinks get an extra boost from a spritz of aromatic water before serving. The water is applied over the top of the glass with an old-fashioned perfume atomizer. Made by the London-based company The Herball, these aromatic waters are distilled using the same method as gin itself, retaining the complete essence of herbs and flowers like the chamomile spritzed over the Strawberry Cup or the geranium, rose and lavender that add a floral twist to the otherwise classic G&T. This article was originally published on Zester Daily (RIP) on 28 August 2014.